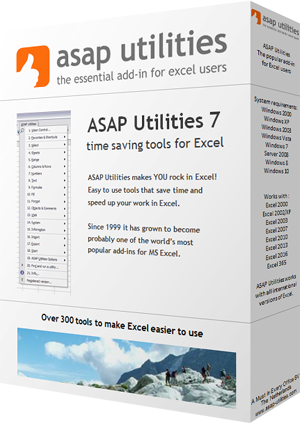 This utility creates or rebuilds the ASAP Utilities toolbar. This is a toolbar that contains a few of the most used tools from ASAP Utilities. You can adjust the size of the toolbar by dragging its border. If you wish to remove toolbar buttons you never use, select in the Excel menu View » Toolbars » Customize. Then drag the unwanted buttons away from the toolbar. When you're finished, click Close to close the Customize dialog box. This utility does not work in Excel 2007 (and later) because Microsoft has removed the toolbars that Excel version. You might also be interested in the utility "(Re) build the ASAP Utilities Favorites menu toolbar".